Irish fiddle player Martin Hayes, one of Ireland’s foremost artists and known worldwide for his innovative and soulful interpretations of traditional music, will make a rare solo tour through New England with a stop at the Towne Crier. These intimate performances of tunes and conversation are a rare opportunity to spend time with a great master of the Irish canon. Martin Hayes’ fiddle playing is rooted in the accent of East County Clare, where he grew up playing with his father, the legendary P.J. Hayes, and his Tulla Ceili Band. “The message always coming to me from my father and lots of the finest musicians of County Clare was their idea of musical feeling," says Martin Hayes. "Music had to have feeling or it was nothing." Hayes' many awards include Ireland's Musician of the Year (TG4), Folk Instrumentalist of the Year (BBC) and Person of the Year by the Irish Arts Center and the American Irish Historical Society, both based in New York. He was named Best Folk Instrumentalist of 2018 at the inaugural RTE Radio 1 Folk Awards in Ireland and was awarded an honorary doctorate from the University of Galway. With guitarist Dennis Cahill, he has toured and recorded as a duo for 25 years. Their highlights include performing for President Obama and members of Congress in 2011. 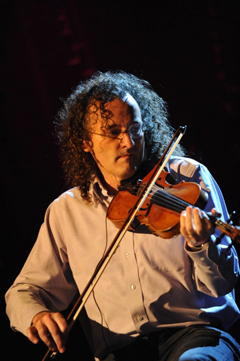 Hayes has collaborated with such extraordinary musicians as Bill Frisell, Ricky Skaggs, Jordi Savall, Cassandra Wilson, Brooklyn Rider, Paul Simon, Sting and Yo-Yo Ma's Silk Road Ensemble on the recent Grammy-winning album "Sing Me Home” and has played with most of the leading Irish musicians over the past 35 years. He is Artistic Director of the annual Masters of Tradition festival in Bantry, Co. Cork, and a curator for the Kilkenny Arts Festival. Hayes is founder of the Irish-American super-group The Gloaming, which was awarded Ireland's Meteor Choice Prize in 2014. His new Martin Hayes Quartet with Dennis Cahill, Liz Knowles and Doug Wieselman had their first American tour in October 2018. Their debut album, "The Blue Room," was called "nothing short of revelatory" by Glasgow Life.